This started with an easy question. How did Chris Christie blow more than $80,000 in less than two years on concessions at MetLife Stadium? We know the governor (now presidential wannabe) spent that much because his office released his spending ledger last month to New Jersey media. It showed the governor dropped $82,594 between June 1, 2010, and Jan. 10, 2012, at DNC Sports, which New Jersey Watchdog identified as Delaware North Sportservice, MetLife’s vendor. According to New Jersey Watchdog, the state’s Republican State Committee paid back the state for the stadium spending in March 2012 “to avoid a potential scandal that could embarrass their rising political star,” and since then Christie hasn’t used his expense account at the stadium. How does one man spend that much money at a stadium? Especially considering that, per Watchdog: “New Jersey’s governor traditionally enjoys free use of luxury boxes for games and other events at the government-owned venue, but food and beverages cost extra.” So if the $82,594 didn’t include all sorts of costs us plebes have to pay for, like tickets and fees, what was he buying? Dozens of player jerseys? Truckloads of Bud Light? An obscene amount of three-for-$10 mini tacos that one Yelp reviewer noted don’t even have toppings? Deadspin submitted a public records request asking for the debit card records, credit card records, and receipts from Christie’s DNS spending. The first response contained records that had already been released: the ledger, a copy of the state Republican committee check, a rundown of the governor’s allowance, and a bunch of papers showing Christie sending his leftover allowance back to the general fund. We wrote back asking why were why were no receipts, credit card records, or debit card records included. The response: They would get back to us with receipts. I apologize if there is any confusion. We have not located any receipts for the DNC Sports charges. Thanks for your email. We have not located any receipts for the DNC Sports charges. Nobody has gotten back to us. But, we think we have a solution to this problem. Because Deadspin did a detailed analysis of Christie’s Wegmans receipts, and he shops like a goddamn American. He buys milk (sometimes, whole! ), bacon (in large quantities), meat, Coca-Cola soda, cheap Chardonnay, and lots of (store brand!) chocolate chip cookies. He also loves Wegmans because he buys everything there, even his flowers. Yes, Christie eats like a goddamn American and if that isn’t his slogan during his presidential run then he’s an idiot. Just, you know, ignore the whole receipts-that-can’t-be-located thing. And so, in the great tradition of American political reporting giving context to everything, here are Christie’s grocery bills, analyzed. You can see all of them by clicking here. He will cater your event with Wegmans. He gets his flowers at Wegmans, just like a guy going on a last-minute date, even though he’s the governor and could get a florist. Don’t get your hopes up for the good stuff if you swing by Christie’s place. Because you’re probably getting the same Chardonnay you buy at the grocery store. Another time it was Ketel One, Robert Mondavi Chardonnay, and Kendall Jackson red, which is fine but, man, you’re the governor! Chardonnay and Coronas. At this point, just get the Three-Buck Chuck. And now he’s going with the Bud Light and the Corona Light. Hey, Maker’s Mark! When at the governor’s mansion, get the bourbon. 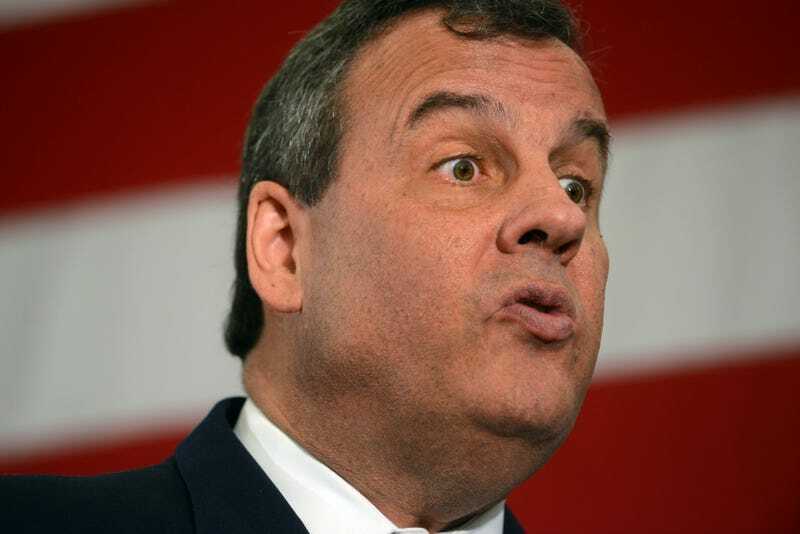 Do you want fancy dessert when you visit Christie’s governor pad? Well, sorry, you’re getting chocolate chip cookies and milk, probably store brand. This speaks either to Christie trying to save taxpayers money or (more likely) his devotion to Wegmans. Another time, he just went crazy with the cookies. Chocolate chip and shortbread! This other time he went double crazy and also got a ring Danish (plus the chocolate chip cookies). Do not mess with Chris Christie’s cookies. One time he cheated and got oatmeal cookies?!? Hot damn, he splurged and got the ultimate chocolate chip (probably cookies, right?). But the biggest shocker was the time he went for the cinnamon buns. He came close this time. Gotta change it up now and then. Sometimes, the governor just buys lots and lots of pork products. Maybe he gets a craving? Has company? The man loves dairy. His chances of trying the 22-day vegan diet is exactly zero. How come we didn’t get invited to this party? Because the food must have been awesome. Then what was up with this People magazine purchase (at Wegmans!) on May 30, 2013?!? Which appears to be this issue (from May 27, 2013). Is this part of courting women voters? Maybe Christie just genuinely cares about Angelina Jolie and the Ohio three. Or perhaps he wanted to know about Prince Harry’s visit to America. Hey, what’s more American than a slightly unhealthy interest in the royal family? Yes, Chris Christie is a goddamn American! Just don’t ask him about the MetLife Stadium receipts.